Unarmed And Ready Out Now! To get a sneak peek, check out our first 2 new singles, Marbles And From Far Away on Soundcloud or watch the From Far Away music video on YouTube! We champion integrity, strive to be examples of sincerity and honor the truth within ourselves. 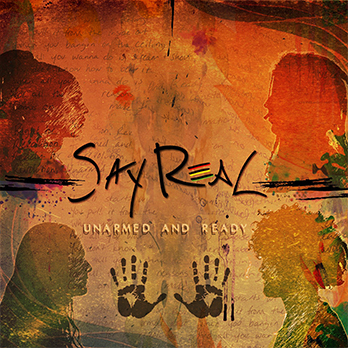 SayReal is a collective of musical revolutionaries and soul-searchers. When these musicians came together for an impromptu show at Hotel Cafe, the fusion of talents felt akin to music’s Big Bang, melding with a chemistry that left the audience convinced they had been playing together for years. Impressed legendary musician/producer, Randy Jackson, sat inconspicuously near the stage, soaking up the group’s positive vibrations. Following the performance, Jackson approached the group and congratulated them, anointing them a “super group,” and encouraged them to continue what they had started. They are a musical force that radiates like a wildfire from the stage, connecting to their audience with a kind of honest intimacy that cannot be contrived. The four musicians embody a strong musical lineage but champion a mission based upon their own experiences. Their songs shimmer, igniting a vibration of Reggae, Rock and meaningful lyric that seem to almost narrate the lives of those listening, leaving audience members feeling alive. SayReal strives to create a soundscape that soothes, excites and inspires humankind to love and live truthfully and with its entirety.